Not everyone has access to a lab grade microscope, and if you’re a doctor in the middle of nowhere that’s an issue that will delay disease diagnosis and potentially put lives at risk, this breakthrough will revolutionise front line medicine. Today we are on the verge of being able to give hundreds of millions of people around the world who still have no formal access to primary or secondary healthcare access to powerful smartphone based detection and diagnostic tools that help them detect the onset of everything from dementia and general disease, to heart conditions, inherited genetic disorders, pancreatic cancers, and skin cancer with nothing more than a smartphone and a free app. but now, in another technology related breakthrough, researchers at the University of California Los Angeles (UCLA) have, for the first time, managed to demonstrate that Artificial Intelligence (AI) and Deep Learning, a powerful form of AI, can discern and enhance the tiniest microscopic details in photos taken by regular smartphones, and the technique improves the resolution and colour details of smartphone images so much that they approach the quality of images from laboratory grade microscopes. As a result the breakthrough could have big implications especially for healthcare in remote regions, and even environmental and pollution monitoring. The team’s technique is low cost and simple, using attachments that can be inexpensively produced with a 3D printer, for less than $100 a piece, versus the thousands of dollars it would cost to buy lab grade equipment that produces images of similar quality. Cameras on today’s smartphones are designed to photograph people and scenery, not to produce high resolution microscopic images, so the researchers had to develop an attachment that could be placed over the smartphone’s lens to increase the resolution and the visibility of tiny details of the photos they take, down to a scale of approximately one millionth of a meter. But that only solved part of the challenge, because no attachment would be enough to compensate for the difference in quality between smartphone cameras’ image sensors and lenses and those of high end lab equipment, so the new technique compensates for the difference by using AI to reproduce the level of resolution and colour details needed for a laboratory analysis. The research was led by Aydogan Ozcan, Chancellor’s Professor of Electrical and Computer Engineering and Bioengineering at UCLA, and Yair Rivenson, a UCLA postdoctoral scholar. 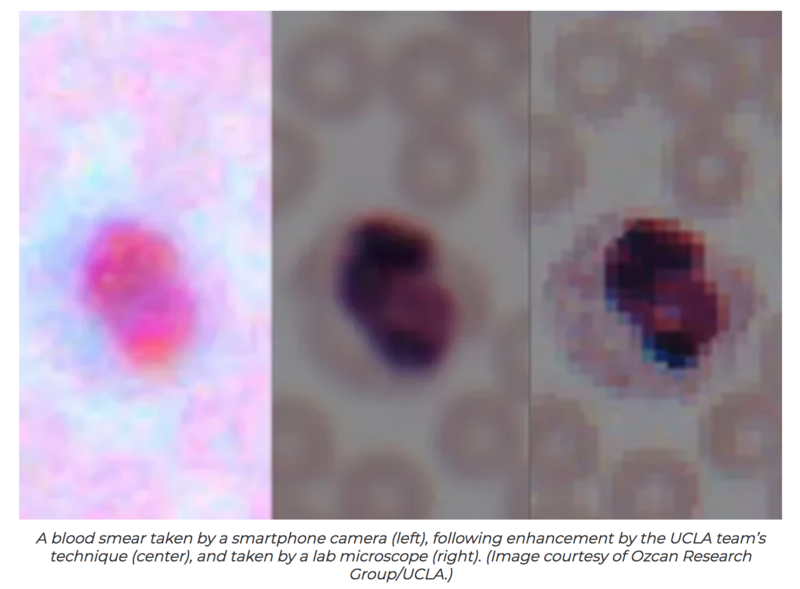 Ozcan’s research group has introduced several innovations in mobile microscopy and sensing, and it maintains a particular focus on developing field-portable medical diagnostics and sensors for resource poor areas. He added that the new technique could find numerous applications in global health, telemedicine and diagnostics related applications. The researchers shot images of lung tissue samples, blood and Pap smears, first using a standard laboratory grade microscope, and then with a smartphone with the 3D printed microscope attachment. The researchers then fed the pairs of corresponding images into a computer system that “learns” how to rapidly enhance the mobile phone images. The process relies on a deep learning based computer code, which was developed by the UCLA researchers. To see if their technique would work on other types of lower quality images, the researchers then used deep learning to successfully perform similar transformations with images that had lost some detail because they were compressed for either faster transmission over a computer network or more efficient storage. The study was published in ACS Photonics, a journal of the American Chemical Society and was supported by the National Science Foundation and the Howard Hughes Medical Institute.